To provide fellowship for the women of the parish community and to provide services for the parish, social camaraderie, and spiritual growth while performing works of charity primarily for the Church of Good Shepherd parish, its ministries, and community. The Ladies Guild provides fellowship for the women of the parish community in support of the parish mission and to promote the Catholic faith and traditions. The Ladies Guild works in conjunction with other ministries by hosting dinners and assisting in charitable events. It works closely with Parish Community Life and the Men’s Club ministries. The Ladies Guild welcomes all the women of Good Shepherd Parish; sisters, friends, mothers, daughters, and parish supporters. With the blessed Mother Mary as our model, our mission in support of the parish mission is to promote the Catholic faith and traditions, nurture strong families and relationships, and contribution to our parish and community through prayer, education, and service, social and charitable events. All women, 18 years or older, Catholic or not, who are registered members of The Church of the Good Shepherd are eligible to be members of The Good Shepherd Ladies Guild. Life Members is a special category of member, one is considered a Life Member if that person is over the age of 70 years and has been a member of Good Shepherd Ladies Guild for over five years. The Ladies Guild meets the third Wednesday of the month at 7:00 pm unless otherwise directed. 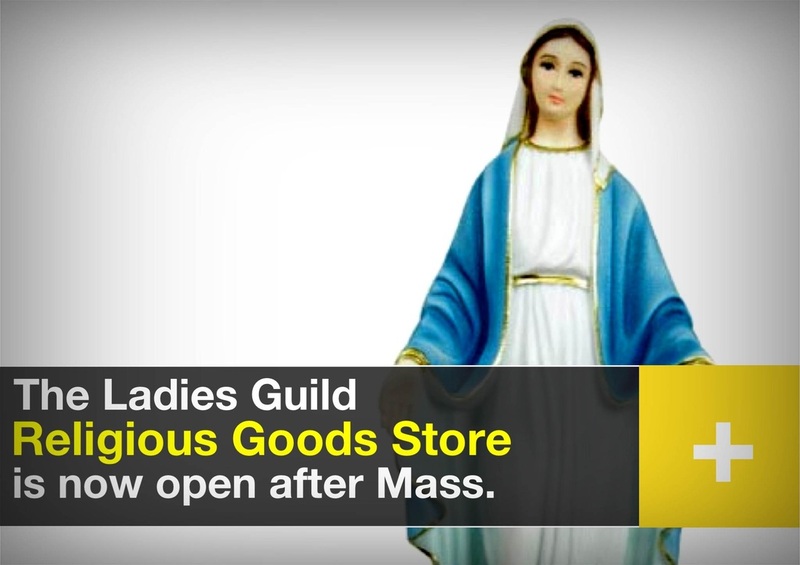 Come and see the newly improved Religious Goods Store after Mass! Hurry and get your First Communion gifts for your loved ones! We have an assortment of rosaries, statues, childrens bibles, wall crosses, holy medals, and other various items.